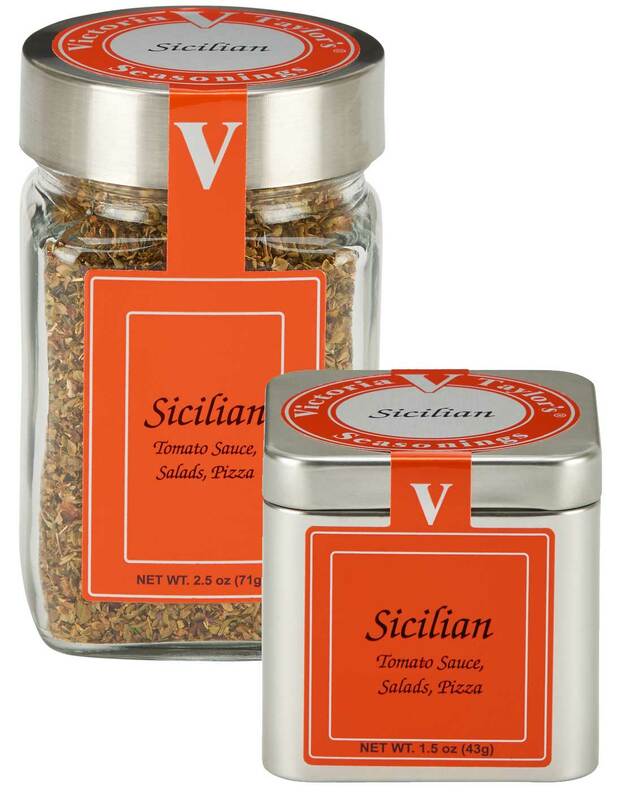 Victoria Taylor's Sicilian Seasoning is a versatile favorite for pizza, pasta, salads and grilled fish. Based on traditional Italian recipes, this aromatic blend of herbs and sweet carrots, accented with red pepper and garlic is the perfect addition to your favorite Italian dishes. As soon as you open the package you'll smell the oregano and thyme and, of course, garlic and a hint of fennel. Make our easy Classic Red Sauce with this Sicilian blend and you will always crave it. Mixed spices (fennel, oregano, thyme, red pepper flake, basil), roasted garlic, sea salt, carrots, sesame oil. I just wanted to write and say that these seasoning blends are the best. I am especially a fan of the Sicilian seasoning. The Herbs de Provence and many of the others are fabulous as well. I purchased a jar of your Sicilian Seasoning a week ago and I followed the recipe on the back of the jar and made some Classic Sicilian Red Sauce using fresh tomatoes from my garden. I had to let you know that it was the BEST sauce we have ever eaten! Even in the finest Italian restaurants!! It was fabulous! I bought some of your herbs at [a local retailer] this week. I used the Sicilian yesterday and it was fantastic! I am looking forward to trying the other as I am sure they are just as wonderful. Last night I had some friends in and showed them what I found. They were impressed just by the aroma. Thanks for a wonderful product. I am sure I will be buying much more in the future and sending plenty of my friends your way. I have tried so many spice blends to simplify cooking and most of the time am disappointed in the single note quality of most blends I find, However, your spice blends have completely rescued me from searching further! I started with one, the Sicilian Blend, and now am happy to have a whole row of your wonderful jars in my pantry.